This pic was taken this week during my visit at BineMusic. Labelhead Jens Rößger and i celebrated our new release “ SEASONS “ Le Quatre Saisons – forthcoming 18th march. And many,many greetings to Alvina Red, our Swedish friend. It’s been 287 years since Antonio Vivaldi wrote his popular masterpiece „The Four Seasons“. 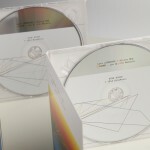 Following in these musical footsteps, Lars Leonhard now takes on the idea of molding the distinct characteristics of Spring, Summer, Autumn and Winter into twelve pieces of electronic music. 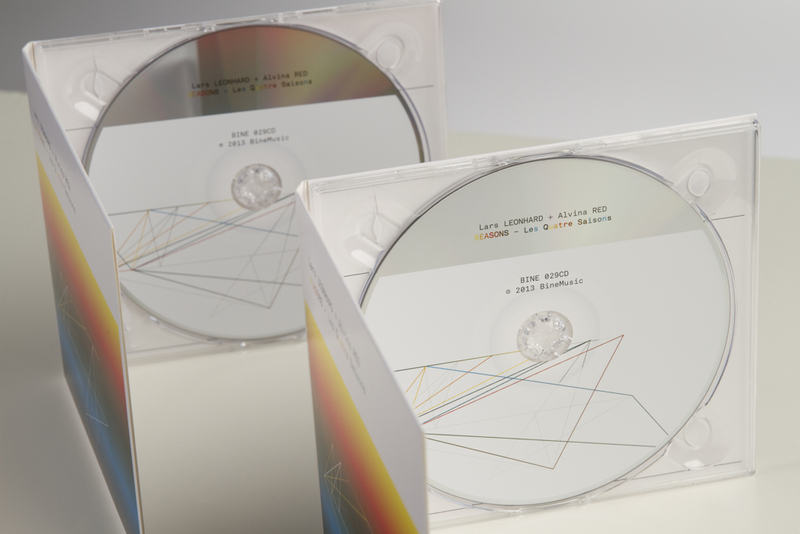 After the previous, purely instrumental releases by the Düsseldorf artist – the remix EP „No Comment“ (2012) and his debut album „1549“ (2011) – his new twelve-track album „Seasons – Les quatre saison“ features singer Alvina Red lending her voice to the first of each four seasons‘ three tracks in pure French – a language whose natural melody is tailor-made for Leonhard’s synthetic yet warming sounds. Living in Stockholm, Alvina Red is no newcomer either, gaining her first professional experience at the age of ten as a background singer for Agnetha Fältskog: the blonde Abba singer was looking for beautiful children’s voices for her song „Take Good Care Of Your Children“ (the b-side of her hit single „The Heat Is On“) and made a find in the clear-as-a-bell voice of young Alvina. 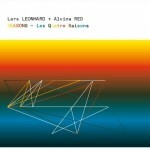 Following further engagements in professional choirs including the Nobel Prize awards in Stockholm and as a singer, songwriter and keyboard player for several band projects, Alvina and Lars Leonhard get together on this joint release. 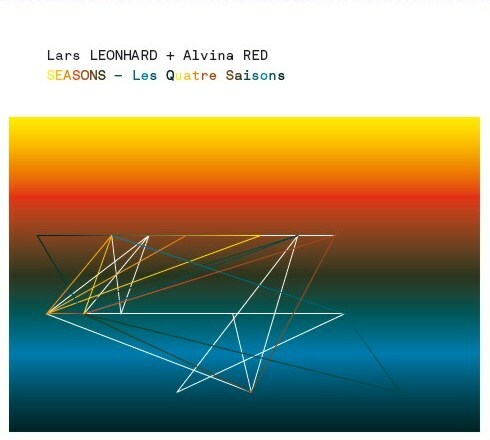 With all tracks written in their respective season to add authenticity, production of „Seasons – Les quatre saison“ took almost exactly one year. Leonhard starts the awakening of nature in Spring with the sleepy minimalistic „Le Printemps“, a digital spring of tiny and frail sound flowers on whose meadow Alvina’s voice flies like a soft breeze. 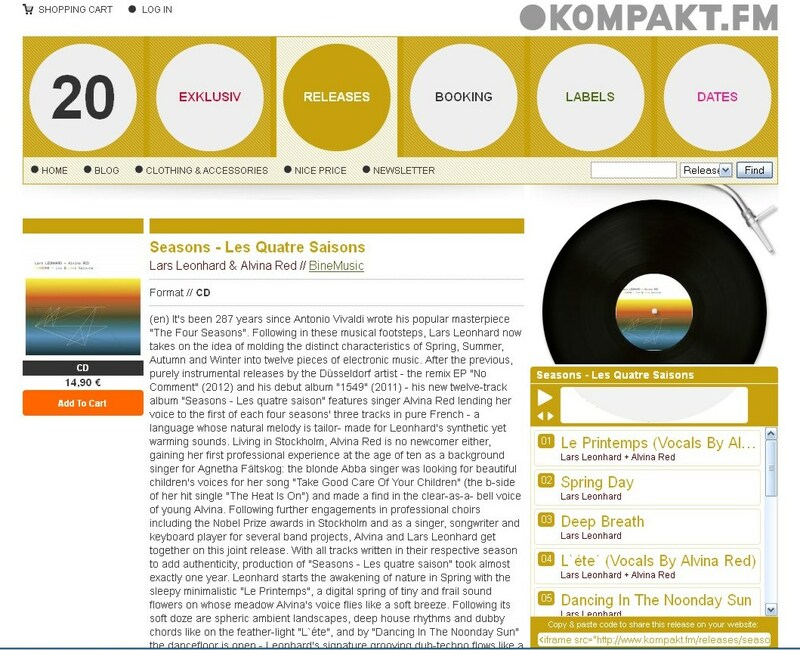 Following its soft doze are spheric ambient landscapes, deep house rhythms and dubby chords like on the feather-light „L`éte“, and by „Dancing In The Noonday Sun“ the dancefloor is open – Leonhard’s signature grooving dub-techno flows like a Tequila Sunrise at the Café del Mar. Who fears for Autumn and Winter to be gloomy and cold is shown the nicer sides of these periods instead. Just like the seasons‘ influence on our lives gets more or less intense, songs like the first cryptic then rhythmic „Colors Of Autumn“ enter the listener’s soul both wittingly or unwittingly before unfolding their energy. And once Winter’s last frozen sound dies away with „Frozen Landscape“, you can look forward to the next cycle of the seasons.